They're well used to winning matches in La Liga and the Champions League, but now Real Madrid's superstars will be flying high all the time. 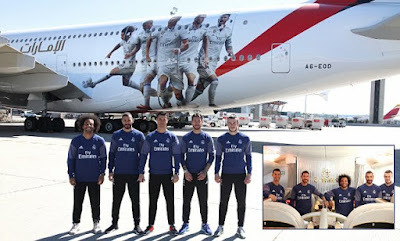 Airlines Emirates has unveiled a new Real-themed aircraft featuring Cristiano Ronaldo, Gareth Bale, Sergio Ramos, Karim Benzema and Marcelo. The A380 plane, which made its first touchdown at the Adolfo Suarez Airport in Madrid on Thursday, featured huge photographs of this quintet of stars in action emblazoned on the side.